Wärtsilä and Ecospec Global Technology, owner of the CSNOx emissions abatement technology, recently signed a Memorandum of Understanding (MOU) to work together towards the common goal of improving the environment by providing the world with clean power solutions. Ecospec CSNOx is an emissions abatement system capable of removing carbon dioxide (CO2) emissions from greenhouse gases, while at the same time removing, in a single system and in one process, sulphur dioxide (SO2), nitrogen oxide (NOx), and other pollutants, without the use of harmful chemicals. 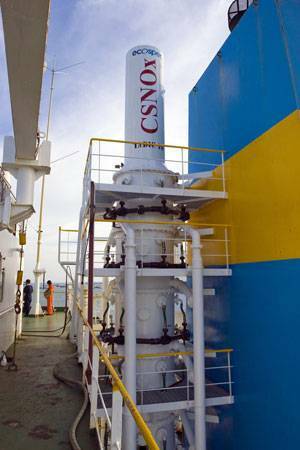 CSNOx serves as the only practical technology with the ability to remove CO2, the main culprit for global warming, from exhaust gases in significant quantities. Its wash water quality surpasses IMO standards, and the discharge water is, therefore, either neutral or beneficial to the environment, and does not result in secondary pollution or problems related to disposal or storage.